4Department of Fisheries and Aquatic Sciences, School of Natural Resource Management, Eldoret University (formerly Moi University), Eldoret, Kenya. Background colour, Stocking density, O. niloticus fry, Growth. The Nile tilapia (Oreochromis niloticus), is the most important farmed fish in the world after carps. Culture of O. niloticus is now a wide prac-tice in the most of the tropical, subtropical and temperate regions (Santiago and Laron, 2002; FAO, 2012). In the past, tilapia was consumed mainly in Africa and Asia where its culture was for subsistence and primarily in freshwater ponds. Currently, increased competition for land among multiple users, need to optimize water use as well as the need for more unit production has necessitated the culture of this species to be prac-ticed in intensive culture systems including tanks. Tilapia culture in tanks usually yields higher critical standing crops (CSC) than many other culture units, albeit with higher inputs of artificial feeds. To optimize production, stocking densities that eventually result to higher critical standing crops (CSC) should be improved. Achieving higher CSC in tanks is limited by a number of foreseen factors linked to fish environment. Tank environment is artificial environments that are very different from the natural habitats of fish and has been shown to reduce significantly the fish welfare and growth at higher densities than earthen ponds (Jobling and Baardvik, 1994). In nature, the feeding success of visual feeders is reliant on the contrast between the prey and its background (Utne-Palm, 1999; Tamazouzt et al., 2000; Papoutsoglou et al., 2000; El-Sayed and El-Ghobashy, 2011). As a result, factors influenc-ing conspicuousness can affect feeding success and growth performance of the fish. Since different coloured backgrounds have been shown to induce a variety of responses in relation to food intake, stress, growth and surviv-al of the fish (Rotllant et al., 2003; Martinez-Cardenas and Purser, 2007; El-Sayed and El-Ghobashy, 2011), tank background colour has been proved to affect larval growth and survival in many fish species and shellfish (Martin-Robichaud and Peterson 1998; Tamazouzt et al., 2000; Rotllant et al., 2003; Rabbani and Zeng, 2005). Fish species preferences for dark tank walls and lighter backgrounds have been shown for several fish species (Ostrowski, 1989; Naas et al., 1996; Martin-Robichaud and Peterson, 1998; Papoutsoglou et al, 2000, 2005; Karakatsouli et al., 2007). Tank background colour may affect fish social interaction (Höglund et al., 2002; Merighe et al., 2004) or contribute to fish stress (Papoutsoglou et al., 2000; Rotllant et al., 2003; Papoutsoglou et al., 2005), which may affect their behaviour, for instance, by altering swimming performance, ac-tivity levels and habitat utilization (Schreck et al., 1997). Consequently, both behavioural and phys-iological responses to stress are energy draining processes that may increase the energy expendi-ture of fish in culture, and reduce growth rates. (Schreck et al., 1997). On the contrary, growth and survival of other species like haddock (Mela-nogrammus aeglefinus) (Downing and Litvak, 1999) and common carp (Cyprinus carpio) (Pa-poutsoglou et al., 2005) were not affected by background colours. In general, the highest growth rates of fish larvae are achieved when background colour optimize the contrast between the feed and the background (Jentoft et al., 2006). Therefore, to improve visual detection of food and food intake, to minimize stress and promote growth, the background colour of tank walls is a major factor to consider in O. niloticus culture. Further, success of tank background colour in improving growth performance of fish could sig-nal the need to improve the stocking density that would optimize the critical standing crop (CSC). The objective of this study was to investigate how the combination of background colour and stocking density affects growth performance and survival of O. niloticus in laboratory condition. Nile tilapia (O. niloticus) fry used in this ex-periment were collected from nursery ponds at Moi University, Department of Fisheries and Aquatic Sciences fish farm, Eldoret, Kenya. The fish were transported to the hatchery, Department of Biological Science, Moi University, Eldoret, Kenya in oxygenated fish transportation bags. The Fish were distributed in 18, 40-liter, glass aquaria filled with well water and acclimatized to the hatchery conditions for a period of one week while being fed on the test diet. The aquaria were illuminated by natural light and each aquar-ium was aerated using air stone diffusers and rearing temperature maintained at 27ºC by aquar-ium water heaters. The aquaria were cleaned by siphoning out the bottom debris (faecal matter, uneaten food) twice a day, i.e. before feeding in the morning and before feeding in the evening and 10% of the culture water was replaced daily with fresh well water of the same temperature. Water quality parameters including water tem-perature and pH were recorded daily at 08.00hours using dissolved oxygen meter. Total ammonia nitrogen (NH3-N) and nitrites-nitrogen (NO3-N) were monitored every week using titra-tion methods explained by Boyd and Tucker (1992). The average values of these parameters throughout the study were: Water temperature = 27.06±0.11°C, Dissolved oxygen =7.59±0.01 mg L-1, pH = 9.86±0.01 mg L-1, NH3-N = 1.17±0.01 mg L-1 and NO3-N = 0.03±0.02 mg L-1. Oreochromis niloticus fry were graded using fry grader, and 1620, O. niloticus fry with indi-vidual mean weight of 0.32g were stocked in the 18 aquaria in triplicate treatment of 3 background colours in combination with 2 stocking densities in a 3 × 2 (tank background colour × stocking density) factorial design. The outside walls and bottoms of each aquarium were painted to achieve one of the two colours (blue and black), one set of aquaria was left noncoloured (clear) served as a control; Fish were reared in blue, black and clear, glass aquaria filled with 30 litres of well water each and stocked at two stocking densities of 2 fry L-1 and 4 fry L-1. The fry stocked at 2 fry L-1 were 60 in number while the fry stocked at 4 fry L-1 were 120 in each of the respective 9 aquaria. During the study, the fish were fed dry commercial tilapia diet (40% crude protein) purchased from Ranaan fish feed Ltd. The fish were fed to apparent satiation at 5% body weight per day, two times daily at 8 hour interval (at 09.00 and 16.00 hours) for 70 days. Sampling was done by measuring a sample of 30 fry for wet weight on an electronic balance (readability 0.01mg, Model VI-200) and total length (mm) using a measuring board to the near-est 0.1mm every 14 days. Fish mortality, food consumption and behaviour were observed on a daily basis. The weight measurements were used to determine the specific growth (SGR), food conversion ratio (FCR), weight gain and relative condition factor of the fry. Survival was deter-mined by counting the remaining fish in the re-spective aquarium at the end of the experiment. Data analyses were carried out using SPSS 17.0 for Windows. The observed variations in fish survival and growth rates (SGR) were tested statistically using general linear model (GLM, univariate type III: All 2-way ANOVA), with background colour (black, blue and clear) and stocking density (2 and 4 fish L-1) as fixed fac-tors. Duncan multiple range test was used to compare means at 95% confidence interval (P<0.05). Growth trends curves in weight for O. nilot-icus for the experimental period are shown in Figure 1. Growth was higher in fish reared in blue background at 2 fish L-1 compared to black and clear backgrounds. Fish reared in blue back-ground at 2 fish L-1 attained a final weight of 5.05 ±0.05g. The lowest body weight (2.71 ±0.02g) was recorded in fish reared in black background at 4 fish L-1. Black background led to reduced growth rates and consequently reduced growth performance (lower final body weight, SGR and weight gain). Both the background colour and stocking density significantly affected fish growth and no interaction (P>0.05) was found between the two factors examined. Fish weight was low at 4 fish L-1 stocking density and signifi-cant differences (P<0.05) were recorded for weight values at the two stocking densities. Food conversion ratio (FCR) was affected by both tank background colour and stocking density, the higher FCR (1.31) was observed in tanks with black background at 4 fish L-1 (Table 1). Back-ground colour and stocking density also had sig-nificant effect (P<0.05) on SGR and weight gain. Among the background colours; black back-ground resulted to the lowest SGR and fish reared at 2 L-1 showed higher SGR (3.94%) and weight gain (1483.35%) than fish reared at 4 L-1 hence significant interactions (P<0.05) were rec-orded between the background colour and rearing density for these parameters. Relative condition factor of the fish populations ranged between 1.00 and 1.01(Table 1). The lower value of 1.00 was recorded for fish populations reared in blue backgrounds at the two stocking densities while 1.01 was recorded for clear and black back-grounds irrespective of the stocking density. Both stocking density and background colour had no significant effect (P>0.05) on the fish relative condition factor (Table 1). Fish body condition factor is a crude measure of the level of energy reserve (i.e. nutritional status) in fish. Reduction of condition factor is a sign of poor condition of the fish. In this study there was no significant dif-ference in the condition factor among the treat-ments. Table 1. Growth performance of O. niloticus reared in blue, clear and black backgrounds at two stocking densities. Values (mean ± SD) with different superscripts in the same row are significantly different at the P < 0.05. Percent survivals for all the treatments were above 96%. Percent survival of fish reared in the blue backgrounds were equal regardless of their stocking densities and they recorded the highest percent survival of 99.17% while fish population reared in black backgrounds showed the lowest percent survival of 96.25% at 4 L-1 stocking den-sity. Stocking density had no significant effect (P>0.05) on the percent survival of the fish while background colour had significant effect (P<0.05) on the percent survival with fish popu-lations reared in blue backgrounds showing sig-nificantly (P<0.05) higher percent survival than fish populations reared in black and clear back-grounds (Table 1). Fish populations reared in black background were characterized by deeply darkened skin pigmentation compared to the fish populations reared in clear background which had light skin colour. However, fish reared on the blue background did not have any change in their skin pigmentation but maintained the colour they initially had before transfer to the experimental tanks. Aggressive interactions were high in fish reared at 4 fish L-1 and more precisely fish popu-lation in clear and blue backgrounds were highly aggressive and had a faster response to feeding, but in the clear background fish could be seen most of the time crowding at the glass surfaces and ‘banging the wall’ of the glass tanks. Fish on the black backgrounds were usually crowded at the corners of the glass tanks while fish reared in the blue background were evenly distributed in the water column. 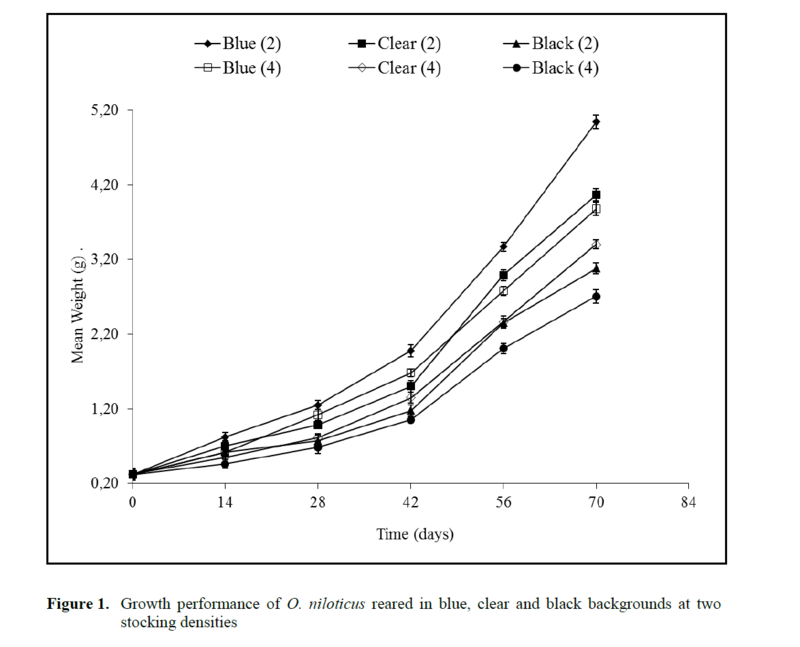 This study showed a clear effect of aquarium background colour on growth performance of O. niloticus fry, with a decrease in growth in aquaria with black background. The low growth rates, weight gain and higher FCR in black background could be related to the reduced food consumption in black background as a result of the poor con-trast between the food particles and the back-ground colour (Duray et al., 1996; Downing and Litvak, 1999; Tamazouzt et al., 2000; Papout-soglou et al., 2005). In African catfish, larvae (Clarias gariepinus) clear backgrounds resulted to low growth and black background did not af-fect the growth of the fish but they attained a darker skin colour (Bardócz et al., 1999). While in grouper larvae (Epinephelus suillus), tan tanks led to effective feeding than black tanks and higher growth was reported in black tanks (Duray et al., 1996). However in this study, higher final body weight and SGR was recorded for O. nilot-icus reared in blue backgrounds and could be re-lated to the good contrast between the food parti-cle and the tank background colour (Duray et al., 1996) which was not possible in the black back-grounds. The importance of high contrast be-tween the food object and the background has been previously demonstrated in feeding success in fish (Utne-Palm, 1999; El-Sayed and El-Ghobashy, 2011). Differences in growth parameters among the background colours could also be related to re-sponse to stress factors. It has been recorded that blue background reduces stress in O. niloticus as a result of inhibition of plasma cortisol level in-crease on fish subjected to confinement stress (Volpato and Barreto, 2001). Black background may have contributed to reduced growth as a re-sult of elevated plasma cortisol levels in the fish and has been reported in a number of fish species (Papoutsoglou et al., 2000; Karakatsouli et al., 2007). Contrary to these Merighe et al. (2004) recorded that blue backgrounds leads to high plasma cortisol levels and are therefore not suita-ble for the culture of O. niloticus larvae. Fish reared on the clear background were positively phototactic and highly aggressive. This character-istic could be explained by aggregation to the walls and increased agonistic behaviour which lead to stress, poor feeding and body damage. Similar fish behaviour has been reported in larval striped bass (Morone saxatilis) (Martin-Robichaud and Peterson, 1998), in marine fish larvae (Naas et al., 1996) in Mud crab (Scylla serrata) (Rabbani and Zeng, 2005) and Artic charr (S. alpinus) (Höglund et al., 2002) and it is possible that a lot of energy which could have been channeled to growth was consumed during this practice (Ellis et al., 2002) and could be the reason for reduced growth rates of O. niloticus in clear backgrounds (Merighe et al., 2004). Fish may demonstrate a preference for a spe-cific background colour, probably to decrease their conspicuousness (Bradner and McRobert, 2001). In an experiment by Staffan (2004), the perch (Perca fluviatilis) could move freely be-tween two tank colours, but did not show general preferences for any specific colour. In this study, a clear difference in body colour was noted for O. niloticus kept in black and clear aquaria, with dark, almost black fish coming from the black aquaria and very pale fish coming from the clear aquaria. The change in the colour of the fish could be as result to Melanin Concentrating Hormone (MCH). Similar observations were rec-orded for rainbow trout (Oncorhynchus mykiss) and Arctic charr (Salvelinus alpinus) reared on black and white backgrounds where it was ob-served that MCH levels were greatly increased in the pituitary gland of the fish reared in white backgrounds (Green et al., 1991; Höglund et al., 2002). MCH has been argued to promote growth in fish as reported in barfin flounder (Verasper moseri) which had an increase in somatic growth when reared in a white background in which the production of MCH was increased (Yamanome et al., 2005). Background colour significantly affected the percent survival of the fish. High percent survival was recorded in blue backgrounds. This contra-dicts the findings of Karakatsouli et al. 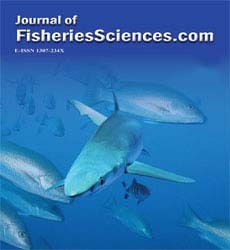 (2007) who recorded no significance effect of back-ground colour on survival of white sea bream (Diplodus sargus) and Denson and Smith (1996) and Ostrowski, (1989) who recorded that black backgrounds led to high survival of white bass (Morone chrysops) and dolphin fish larvae (Cor-yphaena hippurus) respectively. The low survival in clear backgrounds could be associated with the behaviour of larvae which tend to aggregate on the walls and this increase the risk of mortality by abrasion as indicated by Naas et al. (1996). Growth performance of O. niloticus depends largely on stocking density, food quality, energy content of the diet, its physiological status, repro-ductive state, environmental and water quality factors such as temperature, pH, and ammonia (Rakocy, 1989). Important environmental param-eters, affecting feeding behaviour or energy ex-penditure varies with fish rearing density (Jobling and Baardvik, 1994). Among other factors the food accessibility is one of the most difficult pa-rameter to set identical for each fish when density increases and appetite of fish can be impaired by increase in density (Boujard et al., 2002). In the present study, stocking density negatively affect-ed the mean body weight, SGR and weight gain of O. niloticus and the effect is therefore density dependent (Huang and Chiu, 1997). The adverse effects of high density observed on O. niloticus growth confirm findings reported on the same fish species (El-Sayed, 2002; Abou et al., 2007; Muangkeow et al., 2007; Gibtan et al., 2008) and agree with results from other fish species for ex-ample; Clarias batrachus (Sahoo et al., 2004), and Indian major carps (Mohanty, 2004). The fish achieved maximum body weight when reared at 2 fish L-1 regardless of the aquarium background colour. This could be due to fewer fish per unit space in the glass tanks (Sahoo et al., 2004). According to El-Sayed, (2002), low growth rates and high FCR at high stocking densities have been related to the alterations in social and feeding behaviour, stress – induced neurohormo-nal and/ or metabolic changes and deterioration of water quality which leads to stressful condi-tions. Reduced growth at high stocking density have been reported by El-Sayed, (2002), Yan et al. (2002) and Abou et al. (2007) and have been related to space limitation. Difficulties for fish to move and reach the food have been reported by Ruane et al. (2002) in common carp (C. carpio) and Sahoo et al. (2004) in catfish (Clarias batra-chus) and results to low feed consumption. Huang and Chiu, (1997) argued that tilapia is a very aggressive fish so that the stocking density effect on growth performance might be explaina-ble by their competition for territories as well as the permanent stress caused by crowding (Ellis et al., 2002). It was noted that survival of O. ni-loticus was not density dependent and no signifi-cant differences was recorded for the two stock-ing densities examined. This was consistent with the findings of Yi et al. (1996) and Abou et al. (2007); but contradicts the findings of Huang and Chiu, (1997), El-Sayed, (2002) who recorded a negative correlation of fish survival with stocking density. Consequently, the high percent survival of O. niloticus fry at high stocking density indi-cated amenability to the intensive culture prac-tice. The stocking density of 2 fish L-1 gave the best growth and is therefore regarded as the ap-propriate stocking density for the semi intensive tank culture of O. niloticus. It was also demon-strated that O. niloticus growth performance was high in blue backgrounds compared to clear and black backgrounds. From the results obtained from this study, it is therefore recommended that aquaria with blue backgrounds and stocking den-sity of 2 fish L-1 should be used for O. niloticus larviculture to improve their growth performance. Further research should be conducted to examine the influence of background colour on body pig-mentation of O. niloticus by measuring of the plasma MCH concentration. The authors wish to thank Aquaculture Col-laborative Research Support Program (ACRSP/USAID AquaFish CA/LWA No. EPP-A-00-06-0012-00) for funding this research work. Special thanks go to Moi University, Bio-logical Science department for their hatchery fa-cilities and Department of Fisheries and Aquatic Sciences staff and Technician, Mr. Lubanga, for his technical assistance during sampling and sample analysis. Boyd, C.E., Tucker, C.S., (1992). Water quality and pond soil analyses for aquaculture. Ala-bama Agricultural Experiment Station. Au-burn University, Alabama, USA, 183 pp. Brett, J.R., (1979). In: Hoar, W.S., Randall, D.J., Brett, J.R. (Eds. ), Environmental Factors and Growth. Fish Physiology, vol. 8. Aca-demic Press, London, pp. 599-675. Höglund, E., Balm, P.H.M., Winberg S., (2002). Behavioural and neuroendocrine effects of environmental background colour and social interaction in Arctic charr (Salvelinus al-pinus), The Journal of Experimental Biolo-gy, 205: 2535-2543. Rakocy, J.E., (1989). Tank culture of tilapia. SRAC Publication No. 282 Aquaculture Centre Southern Region. Texas, pp 4. Schreck, C.B., Olla B.L., Davis, M.W., (1997). Behavioural responses to stress. In: Iwama G.K., Pickering A.D., Sumpter J.P., Schreck C.B. (Eds. ), Fish Stress and Health in Aqua-culture. Cambridge University Press, Cam-bridge, UK, pp. 145-170. Staffan, F., (2004). Food competition and its rela-tion to aquaculture in juvenile Perca fluvi-atilis. PhD thesis, Acta Universitatis, Agri-culturae Sueciae, Silvestria, pp 329.